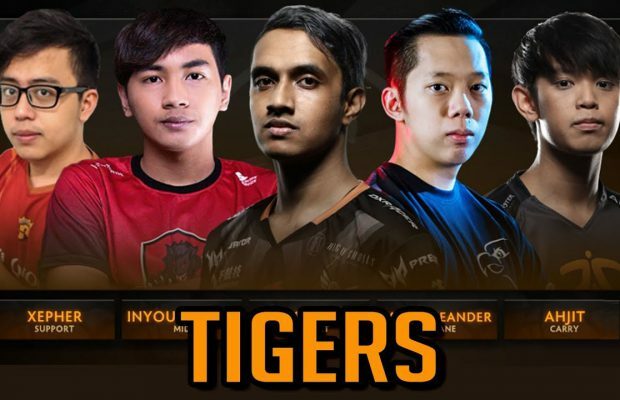 Team Tigers with two Indonesian players, Muhammad “inYourdreaM” Rizky and Kenny “Xepher” Deo won one of the two slots available from Kuala Lumpur Major 2018 Open Qualifier #1. In the decisive match, inYourdreaM and friends managed to conquer 425 (Kawa and Magi) from Mongolia with a score of 2-0. One other slot was won by Team Lotac with material experienced players such as YamateH, Ohaiyo, and Raven, after burying the ambitions of Evos Esports (score 2-0). The Tigers came up with their new squad, following the arrival of Moonmeander and Ahjit who replaced 458 & kYxY. This fresh combination proved to not take long to show off in the DOTA 2 SEA scene. IYD and co. went smoothly and won a Kuala Lumpur Major 2018 SEA Closed Qualifier slot, without losing a single game (9W 0L). Entering the decisive matches, Tigers used his best hero draft with a combination of Huskar, Phantom Lancer, Pugna, Nyx, and Silencer to face the hero composition of Ember Spirit, Lycan, Necro, Dark Willow, and Jakiro from 425v2. Tigers dominance has been seen since the beginning of the game by placing three core heroes in top net worth. Moon who uses Pugna also looks free on the lower lane and successfully destroys 2 towers belonging to 425, in just 10 minutes. Although it was held back several times thanks to the good defense of 425 team, Tigers were finally able to finish the first game in the 34th minute, after winning the big clash in the river area. Losing in the first game, 425 tried more aggressively in drafting heroes in the second match. The selection of Templar Assassins to deal with Invoker IYD proved to be going well. Several times IYD must be picked-up in the mid lane thanks to the vision that Treant has on the 425 team. Luckily, top lane of Tigers managed to dominated thanks to the support of two heroes supporting Lich and Dark Willow. Slowly but surely, the 3 core Tigers (Ursa, Phantom Lancer and Invoker) heroes managed to confine the defense of 425 team. IYD and co. finally managed to finish the match on 36 minutes, as well as qualify for Kuala Lumpur Major 2018 SEA Closed Qualifier. Indonesia actually has the opportunity to pass the team through Evos Esports. Unfortunately, ilLogic and co. must surrender in the hands of Lotac whose majority of players are veterans in the DOTA 2 scene. YamateH et al won 2-0 straight over Evos Esports. Other Indonesian teams failed to get maximum results, such as RRQ which collapsed in the quarterfinals, while BOOM ID and PG. Barracx have been eliminated since the last 16. The hope of seeing the Indonesian team at the 2018 Major event is still open through the second SEA Open Qualifier. This second qualification will determine two teams to accompany the 6 teams that have passed first, namely, Mineski, TNC Predator, Execration, Fnatic, Tigers and Lotac.